Dr. Sanity has a round-up of the psychosphere up--go take a look. Brandi was just 17 years old when she hit and killed her estranged high school boyfriend Daniel. She did it with her parents' car that she snuck out earlier that night. She says it was an accident, but Daniel's family disagrees. They say she purposely ran their son down in a fit of rage. Well, Dr. Phil says the family of the victim should forgive the killer--and her family. This is the only way they will make peace with themselves. The victim's sister gives Dr. Phil a look of disgust and says, "We will never forgive Brandi." Dr.Phil insists that forgiveness is the only solution that will make the pain go away. It's no wonder that people think psychologists are a bunch of self-righteous ninnies who are one brick short of a load when it comes to common sense. It seems to me forgiveness in this case is just another name for a "get this girl out of jail free card." Especially since the conversation from the killer's parents then turned to "how would Brandi serving all this time really help the situation, after all, the victim is already dead." I have heard this over and over from attorneys, social workers and family members in the course of when I am doing an evaluation with a defendant who has been charged with murder. Forget about the victim--he/she is long gone and there is no reason the perpetrator should have to be put out too much by spending all that nasty time in prison. 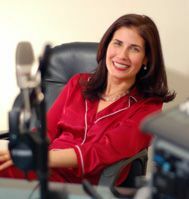 Perhaps Dr. Phil should take some advice from Jeane Safer, PhD, who is the author of Forgiving and Not Forgiving: : Why Sometimes It's Better Not to Forgive. Safer argues in this book that genuine forgiveness is neither easy nor is it always necessary. Carefully choosing not to forgive can also be therapeutic. When this grieving family told Dr. Phil that they chose not to forgive the killer of their son, perhaps he should have kept the therapeutic hype to a minimum--one size does not fit all--and maybe respected their choice, which they've had a lot more time to think about than he has. You would think with all the expertise Dr. Phil purports to have, he would know that. 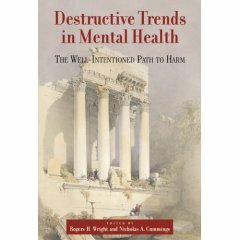 We talk today to Dr. Nicholas Cummings, former president of the American Psychological Association (APA) and author, along with Rogers Wright, of Destructive Trends in Mental Health. Dr. Cummings spearheaded the successful effort to get the APA to stop regarding homosexuality as a mental disease--and now he is treated as an anathema by the same organization he headed--find out why. He discusses the ultra liberal agenda that has captured psychology, psychiatry and social work, why men have fled these fields and the politics of mental health that affect all of us or our loved ones. You can listen to the podcast directly (you don't need an iPod!) by clicking right here, or you can get it via iTunes right here. 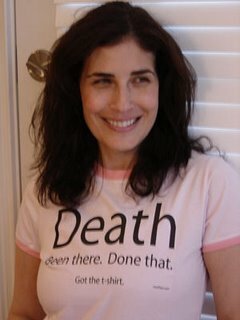 There's an archive of previous episodes here. There's also a collection of low-bandwidth versions for dialup users, etc., available here. The 11th Carnival of Homeschooling is up and being hosted at The Common Room. Shrinkwrapped has thoughts on why those of us in the mental health field are supposed to call our patients "clients" instead of "patients." Go take a look. Update: So from the comments thus far, we have differing opinions as to whether readers wish to be called clients or patients--personally, I don't give a damn so long as my doctor treats me with respect and is competent. That is what I do for my patients--uh...clients, or whatever. What do you think? Update II: Ice Scribe has some more thoughts on doctors being called "providers."